You might be not aware of the companies that know pretty much everything related to your email activities like when you’ve opened email sent by one of their clients, where you are located, what device you’re using, what link you click, all without your consent, even if you haven’t click any link provided in that email. Companies like Yesware, Bananatag, and Streak track emails, usually by adding small pixels or images to those emails which inform the companies that when and where their emails have been opened by the recipients. If you find this something different then let you know that this sort of email tracking is very common practice adopted by many companies. However, in order to detect these tracking emails, now you have a simple but effective tool. Dubbed "Ugly Email", a new Chrome extension warns you when an email you receive in your Gmail inbox have the ability to track you, and it even works before opening the email. Installing Ugly Email is very simple and easy. 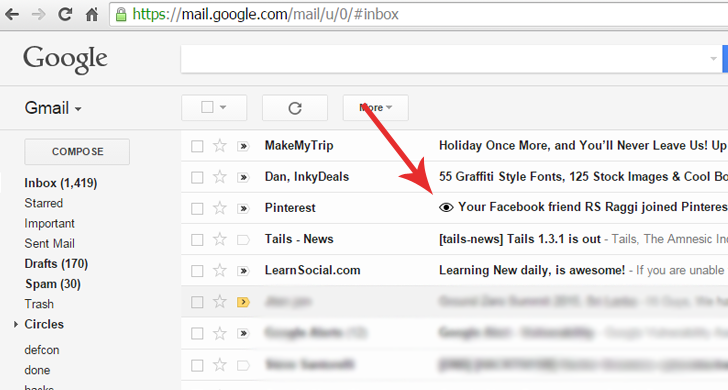 Once installed, you'll see a tiny little eye symbol next to any email that include tracking pixels from one of the three companies that include Bananatag, Streak, or Yeswear. Here's what it looks . Sonny Tulyaganov, Ugly Mail’s creator, also confirmed that "Ugly Mail also doesn’t store, save, or transmit any data from your Gmail account or computer; everything takes place on the user’s end," Brian Barrett of Wired wrote. Click the "Add to Chrome" button, and you're all set! Now, you can sit back and relax because Ugly Email will assured you that which emails arriving in your Gmail inbox are tracking you. However, there are some limitations with Ugly Email at this time. Firstly, Ugly Email is currently built for Gmail only, so outlookers can’t get advantage of the service. Secondly, Ugly Email works only on Google’s Chrome browser, so you need to make sure that you’re using Google Chrome as your web browser while using the service. Although Tulyaganov says that Firefox and Safari versions are in the works. Lastly, Ugly Email is currently effective against only three pixel-tracking providers -- Yesware, Bananatag, and Streak, although it will continue to add more tracking services to its list. At this time, it isn’t clear how long that might take.